Ever see your friend’s photos of food truck eats and feel envious? Where I live, it’s challenging to find food truck eats that are safe for me (gluten-free) and also good for a vegetarian. I scored both at El Mero Taco in Memphis, Tennessee. 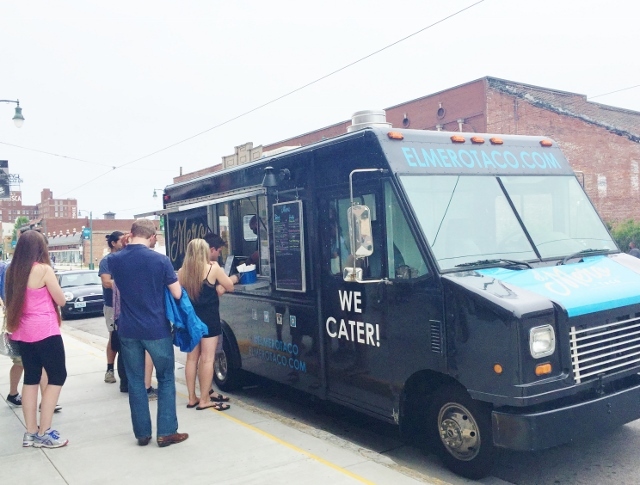 Parked outside of 387 Pantry and Stock & Belle, the El Mero Taco Truck was easy to spot. No other food trucks in the area and a sizable line. We decided to wait the line out and do a little shopping in the stores. 387 Pantry is a gourmet market that I’m sure is handy for those living in the neighborhood or those like me who enjoy discovering a local or regional food find. I brought home Hanna Farms grits and Dr. Beans coffee, both regional products. I also had a great chat with the fella working in the store who told me about many of their products. Really nice shop packed with goodies perfect to eat while in Memphis or bring home. Next door, sharing the same building is Stock & Belle, a clothing, furnishings and home accessories store. 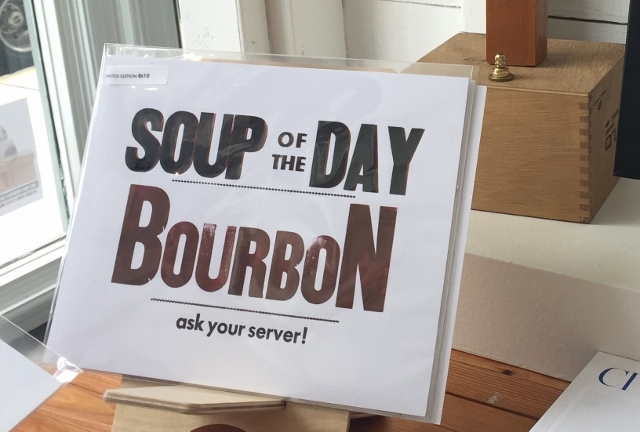 I scored a fun letterpress “Bourbon is the soup of the day” print for my kitchen. Great place to shop AND to enjoy your food treat feast. We were invited back inside to enjoy our eats at the wood-topped bar inside the store, which was ideal for more people- and food-watching. Every person who ordered seemed to have something else I wanted to try! So that crazy idea we had to avoid a long line by shopping for awhile? It WAS crazy! The line only got longer. Word is out about El Mero Taco and we waited for a few minutes to wait. But the impressive part: we waited only a couple of minutes for food after ordering. These folks are speedy. 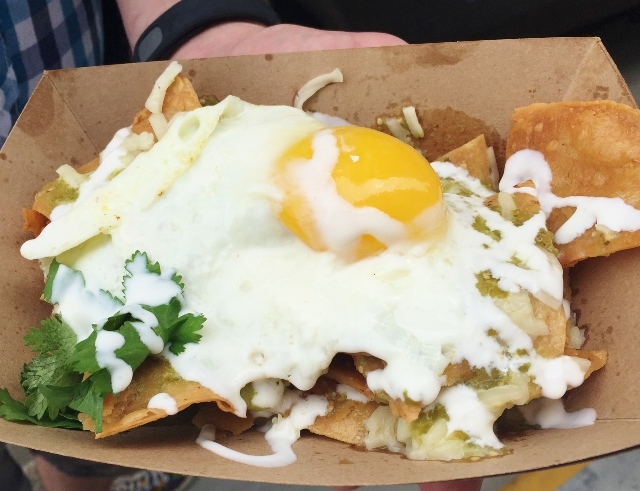 We started with Chilaquiles Verdes, homemade chips topped with tomatillo salsa, cheese, Mexican crema and a local fried egg. Perfectly spicy, egg wonderfully runny. I would eat these for breakfast, lunch or dinner often. 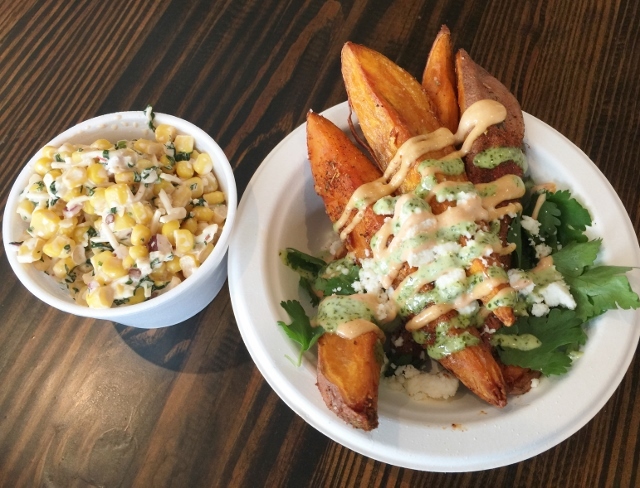 The sweet potato wedges with queso fresco and cilantro and chipotle aioli were also very tasty. There may have been a bit of fork sword fighting to determine who got the last one of these. See that little dish beside the sweet potatoes? That’s for my fellow fans of elotes, Mexican street corn. We both enjoyed the El Mero version: a cup of chilled off-the-cob corn tossed with spicy mayo. This was a different preparation than I have seen and it was oh-so-good. This little cup of goodness is sure to inspire summer recipes around here. Unless they can drive that truck up to Missouri so I don’t have to re-create this dish myself. But the star of the show? The grits. Made with Hanna Farms grits from across the river in Arkansas, mixed with roasted poblano peppers and smoked cheddar cheese plus another runny fried egg on top. These are in the running for the best dish I had while in Memphis. 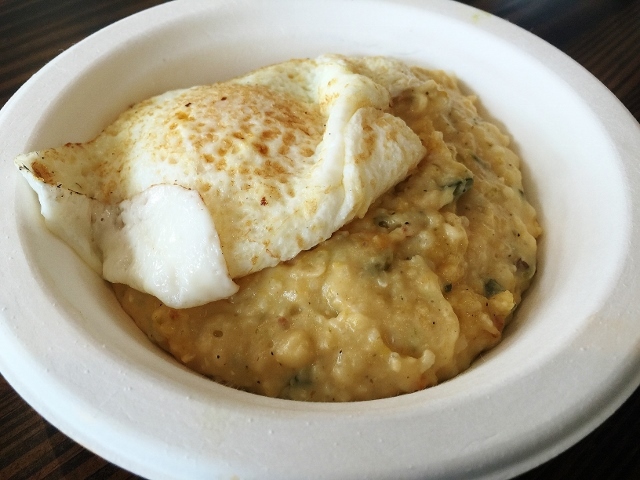 Memphians definitely know how to make good grits, Hanna Farms grits grown from heirloom seeds are a solid foundation, and the manner in which these were prepared and seasoned would be hard to beat. I’ve been on a grits binge since returning home and El Mero Taco is to blame! About gluten-free at El Mero Taco: I always ask lots of questions, especially when away from home. It’s never fun to be sick, but especially bad when away from home. These folks were great to answer my questions and had more than enough options for me to have a great meal. So jealous! I wish I had amazing food trucks like this in our area. I agree! We don’t have many in our area that actually work for me so this was a rare treat. So glad you were able to find a great food truck! Me, too! Finding fresh and local ingredients on a truck was quite a treat. Food trucks have the best tacos! I’d love to give them a try! Memphis is such a fun city to visit. I hope you get the chance to go there AND visit this food truck! When I lived in Germany, we hit up the food truck scene a lot in Nuremberg. I love me some food truck fare!! I can only imagine the goodness at food trucks in Germany! I wish we had one in Georgia! I wish we had one closer to home, too! Vegan recommendations are the good ones! Those Sweet Potato wedges look delish! Food trucks are so fun. Everything looks delish! It really was delish. I can’t stop thinking about those amazing grits! It truly was a winner. I hope I get to visit Memphis again just to eat at this truck! Chilaquiles are my 100% favorite breakfast treat. 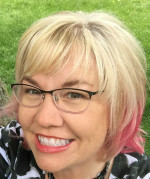 I am so jealous of yours! They look amazing. Looks like you had a killer trip! Memphis is such a great city to visit! We really did have a great trip. They were very good. I would eat them often if I lived in Memphis!